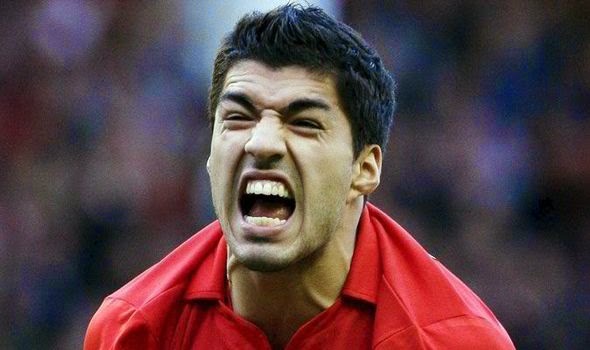 This morning FIFA, football’s embattled governing body, handed down a record nine match ban and a four month general football ban to Uruguay’s Luis Suarez. 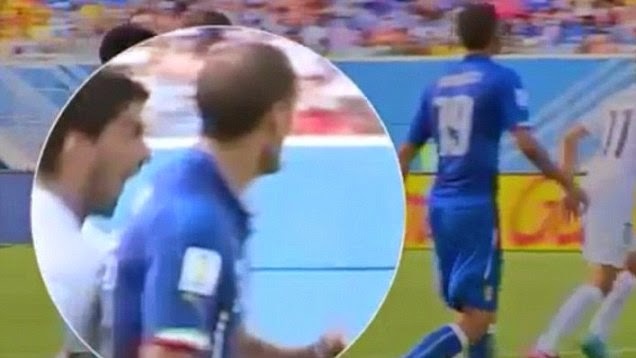 The talented striker, who plays his club football for Liverpool FC in the English Premier League, was found guilty of sinking his teeth into Italian defender Giorgio Chiellini during Uruguay’s match with the Azzurri on June 24. Giving a whole new meaning to the phrase, “I could go for some Italian tonight”, the buck toothed Suarez saw fit to nibble on Chiellini’s shoulder, just prior to his side taking the lead that saw them through to the Round of 16. With Suarez’s Nosferatu act missed by the referee and his assistants, Chiellini reenacted a scene from the Twilight series when he pulled his shirt down to reveal Suarez’s love bite for the match officials to see. At least I think that’s what happened in Twilight, it’s not like I’ve actually watched any of those films. As the referee hadn’t seen the initial incident, Chiellini’s protests were in vain though. From the referee’s perspective there was no way of him knowing whether or not the bite marks were actually from Suarez, or if Chiellini’s wife or girlfriend is a biter and the marks were already there. Uruguay, hilariously tried to use this excuse later and ignore the fact that there was actual footage of Suarez sinking his filthy incisors into the hopefully well seasoned Chiellini. Although the incident wasn’t spotted by the referee or his assistants during the match, the footage quickly spread around the world and eventually found its way to the desk of FIFA’s disciplinary committee. For Suarez, this was his third offense for biting a fellow professional and FIFA really had to act. No one sets a better example for kids on honesty and good behavior than Sepp Blatter and company, so faced with a media storm and public outrage they rumbled into action and handed out a hefty ban to the man with the fangs. 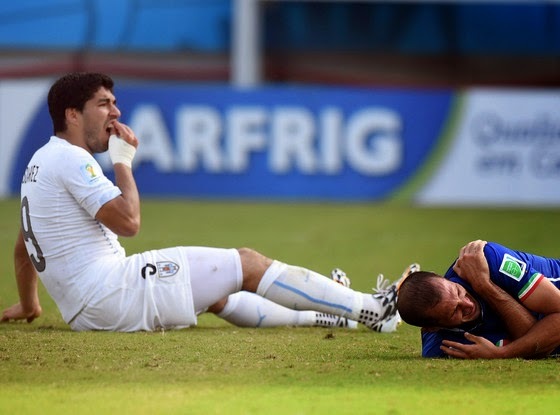 Besides biting Chiellini this week, Suarez also sampled a bit of Dutch when he chomped down on PSV's Otman Bakkal while playing for Ajax in 2010, and just last year he expanded his culinary horizons by sampling Serbia’s Branislav Ivanović during a match between Chelsea and Liverpool. It’s not all flights of tasting fancy for Uruguay’s finest though. 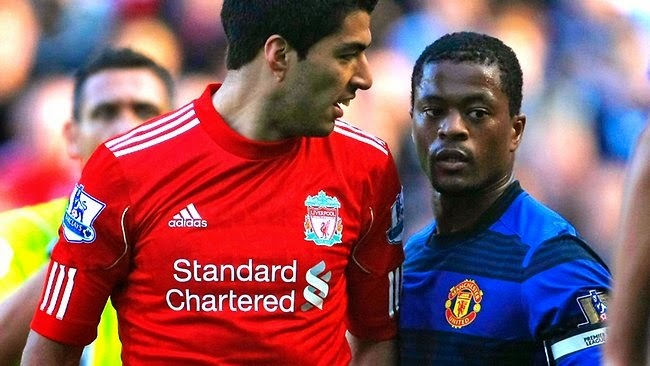 On a darker note he was also found guilty of racially abusing Manchester United’s Patrice Evra during a match in 2011. He showed no remorse for his actions and refused to apologize for his disgusting behaviour. Although he did receive a fine and an eight match ban, the outcry over his biting has been a lot more severe than it was over him racially abusing a fellow player. It’s funny how that works. Besides Suarez’s backwards views on what’s acceptable to say to other players, and his love for human flesh, he also has a tendency to throw himself to the floor if a gust of wind hits him and can be a little nasty with his feet and elbows when the referee isn’t watching. Despite being an absolutely despicable character, he is a very good footballer that will hopefully clean up his act one day. However, as a repeat offender the jury is very much out on that one. The ban handed out today will see him miss a minimum of nine matches and he will miss four months of football related activities. The punishment also includes a stadium ban for Mr. Suarez as well, so supporters can breathe a sigh of relief in the knowledge that there’ll be one less person in the stands that’s likely going to bite them. For his club side Liverpool FC, in which Suarez’s ban extends to, this may actually come as a blessing in disguise. With Suarez heavily rumoured to be the target of transfer bids from both Real Madrid and Barcelona, the likelihood of one of the Spanish giants coming in for him now is greatly reduced.